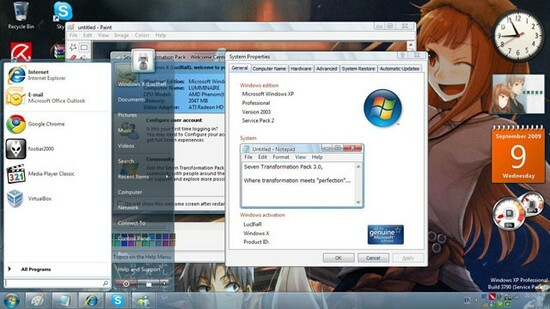 Seven Transformation Pack will convert your XP based system to look like Windows 7 and some of its features emulated. You don’t have to purchase Windows 7 or any 3rd-party applications to get Windows 7 UI experiences. This transformation pack will simply make it done for you for free! This will update your Windows XP and Windows Server 2003 with Windows Seven GUI by adding some themes and replacing system files. Seven Transformation Pack gives to your system the fresh and cool look of Microsoft’s new operating system: Windows 7. The pack changes most of the system icons, skins and toolbars and also adds new enhancements to your desktop.